It’s home to one of the world’s most famous carnivals, but Venice doesn’t limit its magnificent theatrical impact to masks and costumes. From the distinctive Murano glass to the grandeur of St Mark’s Square, lined with 18th-century coffee houses and the beautiful basilica, this opulent destination opens the doors to a luxury holiday like no other. And in its tranquil waterways, food and wine and the UNESCO World Heritage Site of its lagoon and islands, there’s even more to love. To stake your claim on this extraordinary corner of Italy, take a look at Villa Reale, our handpicked apartment in Venice. Huddled away at the Adriatic’s northern-most reaches lies a city of breathtaking romance and enchantment; of intrigue and magic and of a beautiful, gently decaying architecture unrivalled anywhere in Europe. Venice’s settlers happened upon their aqua lagoon and its unique cluster of islands while fleeing Barbarian hoards – and their new home has been enjoying magnetic appeal ever since. Here is a city that rose to become the most powerful in Europe during the Middle Ages – and whose grip on the imagination has never faded. Today, though, it’s tourism that the ‘Queen of the Adriatic’ is fluttering her eyelashes at. And she seduces, without fail. Arched with ornate bridges and lined with the faded pink and ochre hues of timeless buildings, the waterways of ‘The Floating City’ are truly its roads and highways – unchanged since the city was first built upon the wooden piles that hold her head above water (just about) to this day. 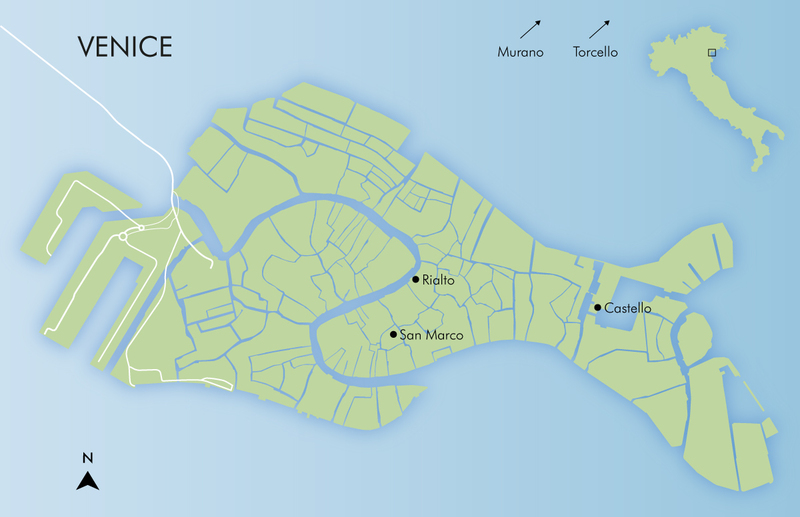 The Venetian Lagoon and many of its 117 small islands are a UNESCO World Heritage Site, offering protection to a city that has long battled against the elements. And it’s easy to see why. An espresso in St Mark’s Square, a cruise along the canals, a wander across the Rialto Bridge: all should be experienced once when in Venice. But to discover the real city, simply enjoy getting lost and exploring the secrets of her labyrinthine alleyways. Here you’ll find the silent paths, quiet canals disturbed only by the occasional barge and the little-known palaces and grand homes, tucked safely away from the tourist hoards. This is where Henry James wrote, Byron found his love and masterpieces hang – seen only by those who chance a detour. A tradition since 1094, the Venice Carnival continues to delight visitors in the run-up to Lent, although the excitement and intrigue of this special time can be felt all year round. The wearing of masks, it is said, has its origins in anonymity – bringing all of society’s revellers onto a common plane without fear of regret or retribution. Today though, celebrations are a lot less secretive. Some three million visitors descend upon Venice for its annual cacophony of balls and parties. Whether you’re one of them – or you’re here at another time – Venetian masks are a common sight, one which has come to symbolise the city (almost) as much as the gondola. Of all the islands in Venice, it’s Murano that can claim to have the most famous tradition for craftsmanship – it’s specialized in the making of fancy glassware for centuries. Castello, a fascinating little quarter offers further examples of artisanal mastery, while little-visited Northern Venice is the place to see fishing boats built and then painted in vibrant hues. There’s an unmistakable buzz to the ‘City of Bridges’ – a vibrant confidence that makes her one of the most enduringly irresistible city breaks in the world. This unique destination, little changed for hundreds of years, floats along to its own vibrant, captivating rhythm. You’ll find it impossible not to jump in with both feet. Simple in ingredients and sublime in flavor, the delights of Italian cuisine are as alive and well in Venice as anywhere else in this gastronomic heartland. True to the city’s maritime situation, fish features on many a menu – with delicious fried sardines slathered in a vinegar dressing of onions, pine nuts, raisins and white wine served absolutely everywhere. Spider crab is another local favourite – excellent aboard a green salad. And do try swordfish carpaccio – a coastal take on the beef version, and first created right here in the lagoon. And wherever you dine, a truly Venetian tradition can always be enjoyed afterwards. Grab some of the local fried, sweet doughnuts called fritelle alla Veneziana and devour while taking a late night stroll through the city’s vibrant streets. Should you dare to test a Venetian’s pride in culinary traditions, try suggesting that Tiramisu were invented in Tuscany, as a Tuscan might claim. Passion for food runs deep here. So deep, it is even said that this is the place where the napkin and the fork were invented. Where could be better than Venice for beginning an evening with a glass of Prosecco? Champagne’s lighter, slightly sweeter cousin reigns supreme as the aperitivo of choice for many – but asking for it to be elevated to the status of a Bellini (with the addition of peach purée) is very much the done thing too. Wine-wise, the powerful reds of the Veneto origin – Valpolicella, Borsalino – offer bold blackcurrant fruitiness, while the region’s famous white, Soave, seems somehow even more quaffable when enjoyed in its place of origin. And let’s not forget grappa – the national spirit (in both senses of the word). St. Mark’s truly is the heartbeat of Venice – a wonder of Baroque architecture, where the city’s political and religious life flourished over the last millennium. The mosaic decoration inside the Basilica has to be seen to believed. It tells the story of Christianity, from the Old Testament to the life of Christ, with important references to the life of St. Mark. You’ll find this iconic building in St Mark’s Square. This icon among Italian museums holds one of the country’s most worthy collections of modern art and displayed in the former home of American trendsetter, heiress, and socialite Peggy Guggenheim. Prepare to come face to face with the work of Pablo Picasso, Salvador Dali, Jackson Pollock and Alexander Calder all under one roof. A sculpture garden is another highlight of Ms Guggenheim’s treasured collections. Located on the Grand Canal between the Church of Santa Maria della Salute and the Accademia Bridge. This architectural masterpiece presents an exhaustive amount of beauty, including a courtyard, grand halls, dramatic embellishments such as frescoed walls, gold-plated ceilings, stunning murals and complex and intricate statues. Don’t miss a visit to the second floor, where guests can view the artwork by Venice’s own Tintoretto including Paradise, an astounding masterpiece covering an entire wall. The palace and museum are in St Mark’s Square, near the Palazzo Ducale pier on the Grand Canal. A chronological wander through Venice’s greatest works of arts, within three separate buildings: the Scuola Grande di Santa Maria della Carità, the Church of Santa Maria and the Canonici Lateranensi Monastery. This treasure trove of artwork, much of it religious, includes the work of Titian, Canaletto and enormous Renaissance masterpieces. Hire a guide to help you make the most of them. The galleries are near the Accademia Bridge in the Campo della Carità. You can get there on foot or by vaporetto. One of the most visited museums in Venice offers stunning views of the Basilica from its balconies – and it’s not hard to imagine VIPs from days of old attending lavish functions here. Home to the bronze horses that once stood guard outside the Basilica, the collection also includes religious items, jewellery, manuscripts and mosaics. This museum is another reason to linger around the famous St Mark’s Square. A powerfully imposing church that reflects the architecture of Ancient Rome – in perfect Palladian style. The interior is painted with wonderful frescoes by Tintoretto, Jacopo Palma Giovane and Sebastiano Ricci, among others. The bell tower, which was rebuilt in 1790 after the collapse of the original one in 1774, has always been in competition with that of St. Mark’s for the most striking view over Venice and its Lagoon. Make your way to the island of San Giorgio Maggiore, one stop on the boat from St Mark’s Square. For hundreds of years, the island of Murano has been world-famous for its intricate glassware. Today, centuries-old techniques are alive and well on the island where you can witness them first-hand, before leaving with a beautiful souvenir. Dating back to the 17th century, these flat-bottomed, uniquely Venetian rowing boats were once the chief means of transportation in the floating city. Today, just 500 are in active service – moving tourists effortlessly around the city in romantic (and beautifully predictable) style. This Venice institution has been serving tea to the well-healed since forever, and a visit here simply must be made. The views across St Mark’s Square are as eye-watering as the prices, but the experience is considered to be worth every cent. Once past the awe-inspiring facade of the Basilica di San Marco, the intricate mosaics and frescos adorning the vast interior will take your breath even further away. A true symbol of a nation’s former glory days. One of just four bridges spanning the Grand Canal, the Rialto is surely the most elegant. Laden with shops, the bridge is one of the true hotspots of Venetian tourism – and the gateway to the famous market that lends the bridge its name. To sip Prosecco laced with peach liqueur is a Venice tradition not be missed. To do so in Harry’s Bar is to enjoy a Bellini in its birthplace – adding an extra touch of magic and enjoyment to your post-tour sundowner. The Venetians’ expertise with seafood is nowhere more evident than at this spectacular fish market. Bustling with tourists the Rialto may be, but there’s a satisfaction in knowing that this is the real deal; the lifeblood of the city’s finest restaurants. Reflected in aqua marine waters, the vibrantly coloured houses of this charming island are as much a draw as its leaning bell tower or the local lace that people flock here to buy. A visit to Burano is a delightful one – and a chance to experience a slower pace of Venetian life. Famous for spectacular Byzantine mosaics inside the Cathedral of Santa Maria Dell’Assunta, much of Torcello is a nature reserve and offers the chance to escape the crowds to enjoy a pleasant and peaceful stroll through stunning scenery. The famous Carnevale takes place in the two weeks leading up to Shrove Tuesday (Feb/Mar) - a time when International revellers flock to Venice for a fortnight of masked balls and sophisticated partying. it's one of the worlds’ most famous annual events. The Art Biennale is contemporary art’s most important gathering, where superstar artists and major curators meet, mingle and muse at various venues around the city. The Architecture Biennale is a meeting of the greatest architectural minds – in the city that exudes the greatest architectural style. A true celebration of urban design. The Festa del Redentore brings with it fantastic firework displays to celebrate the end of the great plague of 1576. After the show, many head for the island of Lido to watch the sun rise. The Venice Film Festival is one of the world’s oldest film festivals and takes place on the island of Lido. Expect, glitz, glamour and more than a little giddiness.